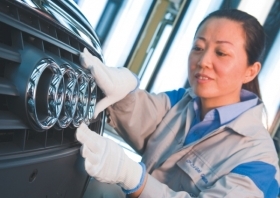 Audi's July sales in China surged 53% to 20,537 vehicles, while global sales grew 7.7%. SHANGHAI (Bloomberg) -- BMW AG, the world’s largest luxury carmaker, Volkswagen AG’s Audi unit and Daimler AG's Mercedes-Benz brand are making up for faltering sales at home by selling more cars in China even as industrywide demand cools in the world’s largest auto market. Audi sold 53 percent more cars in China in July compared with a year earlier, while Daimler, the world’s second-largest luxury-car maker, tripled sales of its Mercedes-Benz brand to 14,500 vehicles and BMW raised its deliveries 82 percent to 13,852, the companies said this month. Sales of Audi and Mercedes fell in Germany for the month, while BMW sales increased 4 percent. Demand for upscale cars in China may outstrip the overall car market during 2010 as a growing number of wealthy Chinese boost demand for upscale models. Research group J.D. Power & Associates estimates sales of luxury vehicles in the nation will rise at almost double the industry pace of 20 percent to 530,000 units this year and reach 1.1 million by 2015. “Limited competition, very strong growth and a willingness to spend money. That combination is just explosive,” said Michael Dunne, president of automotive research firm Dunne & Co. Rich Chinese are “declaring their success to their friends, family and colleagues with what kind of car they are driving,” he said. Sales in China are helping the German automakers increase profit even as car sales during the first six months of the years rose just 0.6 percent in Europe, their most important region by deliveries. Vehicle registrations in Germany fell 30 percent in July, according to figures from the Federal Motor Vehicle Office in Flensburg. Volkswagen reported its biggest quarterly profit in two years on July 29 in part because of demand in China for Audi models. Audi’s China sales have outstripped growth in other markets, the company said in a statement last week. Sales of its cars, including the Q5 premium medium SUV and A8L sedan, surged 53 percent to 20,537 vehicles in China, while the brand’s sales grew 7.7 percent worldwide. BMW, which sells the 3-, 5- and 7-series models in China, reported its best quarterly profit in two and a half years, the company said in a statement this month. Deliveries in China more than doubled in the first half and accounted for about 11 percent of all sales, BMW Chief Financial Officer Friedrich Eichiner said on an Aug. 3 conference call. Daimler raised its 2010 operating profit forecast to 6 billion euros ($7.8 billion) on July 27 after beating quarterly estimates. It cited higher sales in China and the United States. Non-luxury automakers are faring less well in China as the government takes steps to cool the economy and higher inflation cuts disposable incomes. Industrywide growth slowed to 13.6 percent in July, the lowest in 16 months, the China Association of Automobile Manufacturers said on Aug. 9. Sales may begin shrinking as early as next month, according to Daiwa Institute of Research. Ford Motor Co. and Zhejiang Geely Holding Group Co. said this month that sales in July fell from a year earlier, while BYD Co., the Chinese automaker backed by Warren Buffett, cut its full-year sales forecast by 25 percent to 600,000 vehicles from 800,000 on Aug. 4. Still, luxury sales will continue to advance as the number of wealthy Chinese increases and automakers extensively offer their latest models, said Jenny Gu, a Shanghai-based analyst at J.D. Power.